Today, carols echo freely throughout much of the world—not only from homes and churches but also from elevators, skating rinks, and shopping mall sound systems. Two types of Christmas carols have been composed over the years. Music and lyrics concentrate on either the Christian celebration of the birth of Jesus or focus on more secular themes, such as winter scenes, family gatherings, and Santa Claus. We'll explore a little background on both and a lot of sounds from the 40s and 50s. A playlist of the best carols of our times follows the brief histories. You may want to start it right away so you can listen while you read. Just click on a carol you'd like to hear and the play list will pick the rest and keep playing. Or, you can continue to pick and play. Enjoy! The video below contains a history of several carols accompanied by beautiful Christmas music. The tale itself is a little hard to hear so I've added a brief history. Enjoy the words as you listen to the lovely caroling. Early Christians began celebrating Christmas at the same time of the year as the Winter Solstice and similarly worshiped with special holiday songs. The majority of these songs, the first true Christmas carols, were written in Latin and only understood by members of the elite and the clergy. As a result by the Middle Ages, the majority of Christians lost interest in Christmas carols altogether. In 1223 St. Francis of Assisi reversed those feelings when he produced his Nativity Plays in Italy. Normally, his actors sang songs that told the play’s story in the language of the people. Not only did the listeners understand the words but were welcome to join in the singing. Most of these new carols were not based strictly on Scripture but were simply light-hearted musical stories. The carols quickly became favorites of traveling minstrels, who changed the words from town to town to fit the needs of various communities. These carols, rarely sung in church, became quite popular in England as well as France, Spain, Germany, and other European countries. When Oliver Cromwell and the Puritans came to power in England in 1647, the celebration of Christmas was curtailed and singing was prohibited. The carols, however, did survive; people sang them in secret. During Victorian times William Sandys and Davis Gilbert traveled throughout England, collected, and then published lots of old Christmas music. Interest in Christmas carols was revived; and people began singing them in homes, churches, and even in the streets. The tradition of caroling from home to home was born and with it the custom of rewarding the singers with gifts of money, food, drink, and/or small gifts. The joy of Christmas carols filled England once more and spread throughout Europe and eventually to America. Many carols we sing today date back to 19th Century Victorian England when they were first published. The First Noel (1823), God Rest Ye Merry, Gentlemen (1833), I Saw Three Ships (Come Sailing In) (1833), Here We Come A-Wassailing (1850), Good King Wenceslas (1853), and Deck the Halls (1862), are examples. The United States contributed Go Tell It on the Mountain (1865), It Came Upon the Midnight Clear (1849), and We Three Kings of Orient Are (1863); and France’s Angels We Have Heard on High (1862) has also remained popular over the years. Nineteenth Century Austria produced what is probably the number one carol of this genre. Written by Franz Gruber and Josef Mohr, Stille Nacht! Heilige Nacht!, has remained widely played since its introduction, though it's better known to us as Silent Night! Holy Night!, thanks to the translation of John Freeman Young. It's thought that the song might have first travelled around the area with an organ repairman, Karl Mauracher. In December 1832, The Von Trappe family - of Sound of Music fame - discovered the song and performed it; and then the Strasser family included it in one of their concerts in Leipzig. Stille Nacht was first performed in the USA in 1839 by the Rainer family, who sang at the Alexander Hamilton Monument outside Trinity Church in New York City. During this time the tune changed to the one we know and sing today! John Freeman Young translated Stille Nacht into English in 1863. 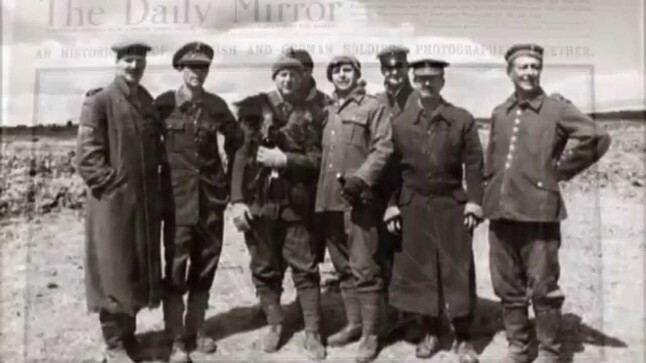 Unforgettably, the carol was sung at the Christmas Truce during the First World War in December, 1914 as it was a song that soldiers on both sides knew - a poignant moment for all soldiers present and for all who read and hear about it! Stille Nacht or Silent Night, or however it’s translated, is now one of the most recorded songs in the world! NO, IT’S NOT JUST YOU AND ME! At this time of year, the majority of people listen to music that was written and recorded 50, 60, even 70 years ago. This occurs over and over again, every year, in spite of the fact that new songs have been, and are being, composed annually. Like the ghosts of Christmas past, the sounds of Bing Crosby, Perry Como, Ella Fitzgerald, Dean Martin, Judy Garland, Nat King Cole, and Frank Sinatra return to Top-40 radio, CD players, iPads, and whatever, again and again, during Christmas time. A few years ago, two research companies, Edison Media Research and Pinnacle Media Worldwide, conducted independent surveys to discover the preference of Christmas carols. 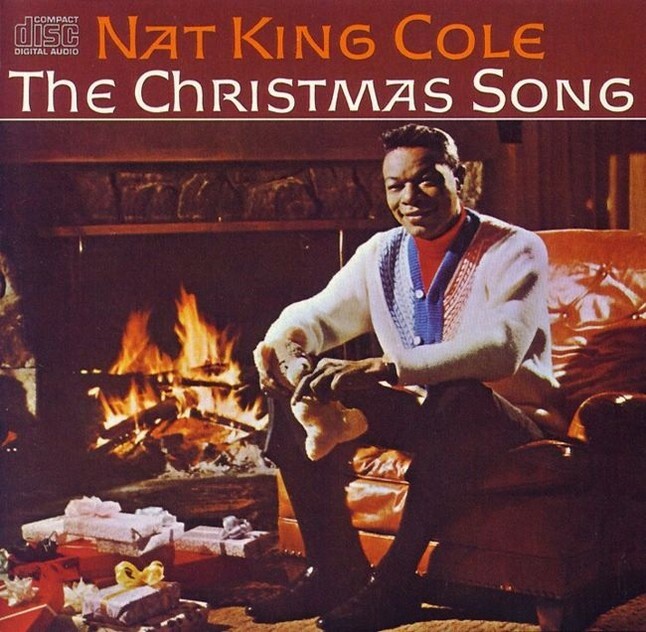 Topping both lists were the older holiday standards: Bing Crosby’s White Christmas, Nat King Cole's The Christmas Song (Chestnuts Roasting on an Open Fire), and A Holly Jolly Christmas by Burl Ives. The number one recording, to no one’s surprise, was Crosby’s White Christmas. If the surveys were repeated this holiday season, songs two and three could be different; but song number one would probably remain the same. White Christmas, written by the highly-regarded composer/lyricist Irving Berlin, became one of the most commercially successful singles of all time as well as the top-selling single ever. The song's success couldn’t have surprised Berlin, who is documented as racing into his Manhattan office in January 1940 and directing his musical secretary to transcribe, "The best song I ever wrote . . . the best song anybody ever wrote!" Crosby's recording of White Christmas received extensive airtime on Armed Forces and commercial radio during its first Christmas season in 1942. 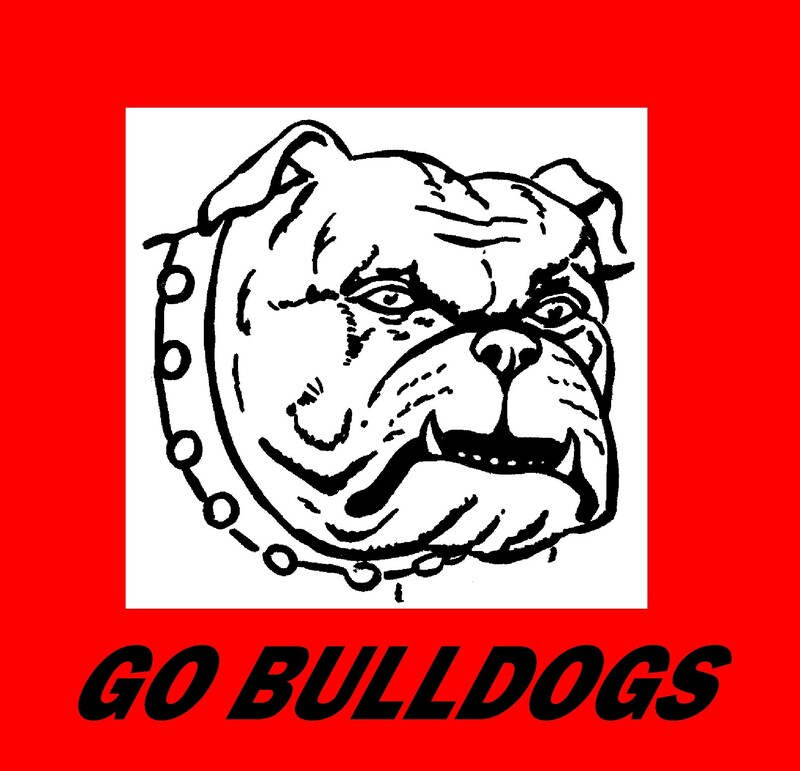 It became an instant number one pop hit and returned to the Hit Parade pop chart for twenty subsequent years. Released during the middle of WWII, the melancholy, homesick tone of White Christmas assuredly boosted its sales for it was incredibly poignant to those away at war and those at home. Every generation since its release, however, seems to embrace and savor the reflective mood the song conveys. Thus, Crosby's White Christmas will probably always remain at the top of all Christmas carol rankings. 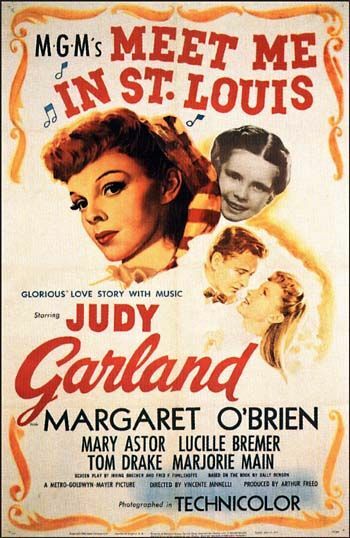 Judy Garland first performed the holiday carol Have Yourself a Merry Little Christmas in the 1944 musical Meet Me in St. Louis. This song also made its debut during WWII, and lines like, “let your heart be light / Next year all our troubles will be out of sight,” captured the country’s temperament. Interestingly, the song was originally much darker, but Garland and her co-star Tom Drake pushed creator Hugh Martin for a few rewrites to make it a little more cheerful. In fact, the lines above were originally, "It may be your last / Next year we may all be living in the past” –not full of Christmas joy, is it? Hugh brightened the lyrics more at Frank Sinatra’s request for Sinatra’s recording in 1957; and later, Garland re-recorded the song with the new words. Consequently, most versions you hear today include, "hang a shining star upon the highest bough" instead of the original line, "until then we'll have to muddle through somehow." Christmas carols must be composed and ready before the season so the song writer may be thinking about winter weather in the midst of a July heat wave. The Christmas Song, better known as Chestnuts Roasting on an Open Fire, is one such example. Writers Mel Torme and Bob Wells were trying to stay cool by thinking cool during the miserably hot summer of 1944. Bob started writing lines like “Jack Frost nipping at your nose” and “folks dressed up like Eskimos;” and about forty minutes later, the duo had created what became the most-performed Christmas song of the last century. The Twelve Days of Christmas does not make the “most favorite list”, which makes sense to those—like me—who hate repetition, but it is interesting because it's so often misunderstood. For example, listeners may believe that the twelve days mentioned are before Christmas when in actuality, they are supposed to be the ones following Christmas Day. Most people also assume that the singer is merely repeating the gifts previously given and then adding a new gift each day. The “true love” in question is, in fact, giving all gifts mentioned on each day. So, in reality during the twelve days, the recipient receives twelve partridges, twenty-two turtle doves, and so forth for a total of 364 gifts. More confusing than the context and the number of gifts though are some of the gifts themselves. For example, four calling birds are supposed to be four colly birds, which are blackbirds. It also seems odd that the “true love” would give a bunch of birds (partridge, turtle doves, French hens, and blackbirds), give five golden rings or jewelry on day five, and then go back to giving birds (geese) on the sixth day. The truth is that the golden rings are really a reference to pheasants, specifically the rings on their necks. So in reality, the first seven gifts are birds, which may make more sense but is an awful lot of birds, especially by the time the song is over. 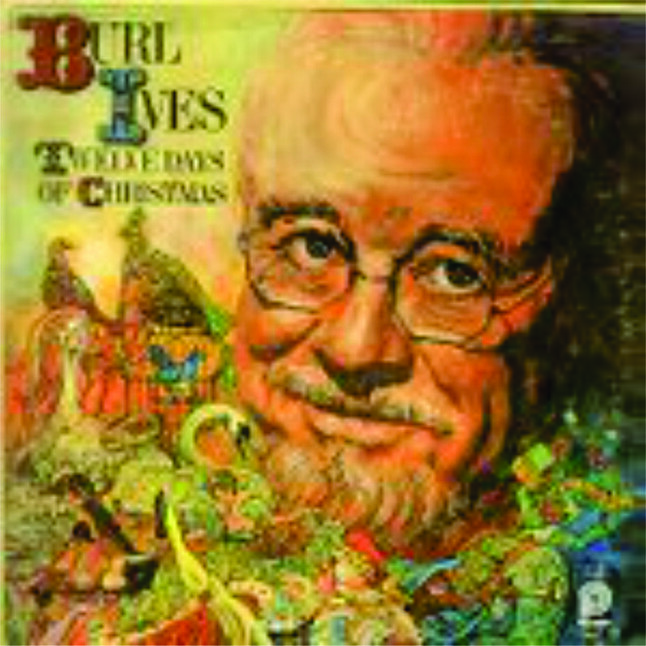 Burl Ives recorded the traditional version of The Twelve Days of Christmas in 1951; Perry Como added his adaptation in 1953. The light-hearted aura of the Christmas season easily spawned several novelty tunes during the Forties and Fifties. Donald Yetter Gardner was teaching music at the public schools of Smithtown, New York when in 1944 he wrote All I Want for Christmas (Is My Two Front Teeth). He had asked his second grade class what they wanted for Christmas and noticed, as they answered in a lisp, that almost all of the students had at least one front tooth missing. Gardner wrote the song in 30 minutes. In a 1995 interview, Gardner said, "I was amazed at the way that silly little song was picked up by the whole country." All I Want for Christmas was finally published in 1948 after an employee of Witmark Music Company heard Gardner sing it at a music teachers' conference. Spike Jones & His City Slickers made the original recording in December, 1947. It reached the top of the pop charts in 1948 and again in 1949. Gene Autry had the idea for Here Comes Santa Claus (Down Santa Claus Lane) after riding his horse in the 1946 Santa Claus Lane Parade in Los Angeles. Crowds of spectators had been chanting, "Here comes Santa Claus;" and the chants inspired him to write the lyrics to the song, and Oakley Haldeman set it to music. A demo recording of Here Comes Santa Claus was made by singer/guitarist Johnny Bond in which ice cubes were used to mimic the sound of the jingling sleigh-bells. 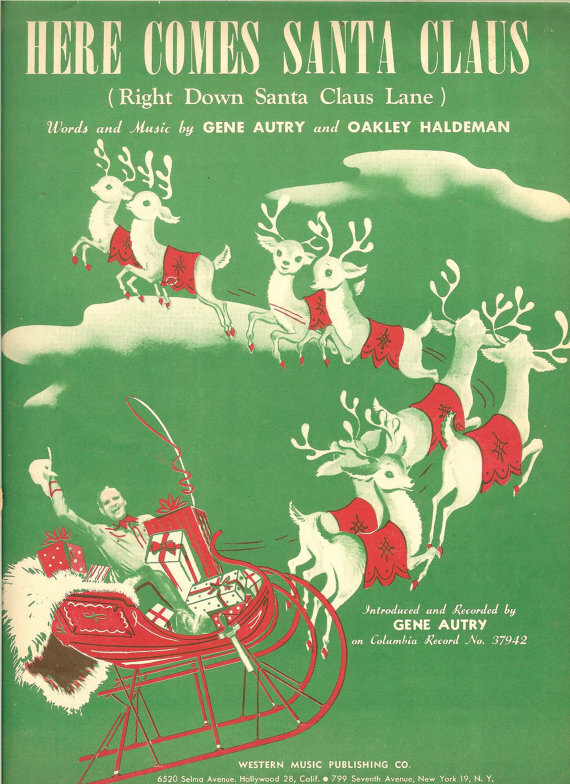 This prompted the use of real sleigh-bells in Autry's own recording of the song in 1947. His version was released as a single by Columbia Records and became a number five country and number nine pop hit that same year. No man has contributed more to the Christmas music genre than Jonny Marks, who in addition to Rudolph, the Red-Nosed Reindeer wrote such classics as Rockin’ around the Christmas Tree, A Holly Jolly Christmas, Silver and Gold, and Run Rudolph Run. Interestingly, despite writing so many of modern day Christmas classics, Marks didn’t even celebrate the holiday; he was Jewish. Marks' career in Christmas music started when he wrote Rudolph in 1949. The carol was based on a poem that was written by his brother-in-law, Robert L. May who worked for the Montgomery Ward Company in Chicago. 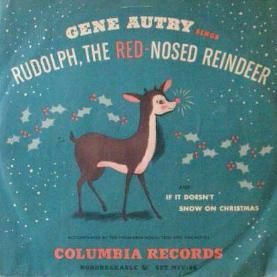 Rudolph was Marks’ biggest hit and sold a total of 25 million copies. He also became a movie star and was immortalized in books and toys; Rudolph still enjoys widespread popularity today. Armenian-American actor Ross Bagdasarian, calling himself David Seville, created the three Chipmunks, who he named after Liberty Records executives Alvin Bennett, Simon Waronker, and Theodore Keep. Seville had recorded voices at a slow speed and played them back at a higher speed in his novelty recording Witch Doctor in 1957. 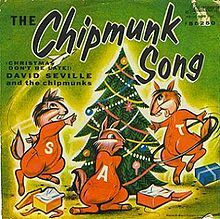 He used the same technique to produce the chipmunks’ sound in 1958 for their recording, The Chipmunk Song - Christmas Don't Be Late. 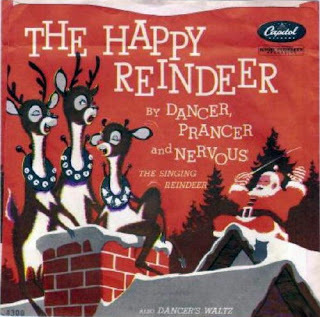 Written by Harold Rustigian and Robert Plaisted, The Happy Reindeer was released in 1959. Dancer, Prancer, and Nervous, The Singing Reindeer, sound remarkably like the Chipmunks. They, however, cut only one other record (The Happy Birthday Song/I Wanna Be an Easter Bunny) and did not star in any movies. The Happy Reindeer received moderate success in both the U.S. and Canada. Fathers have been dressing up for years in white beards and red suits to make their children think that the real Santa Claus has arrived so the youthful rendition of I Saw Mommy Kissing Santa Claus was immediately accepted. Twelve-year-old Jimmy Boyd recorded a version of the song that sold nearly 2 million copies in its first year. Zany Spike Jones recorded another version which also became popular. The music and lyrics of I Saw Mommy Kissing Santa Claus were written by Thomas P. "Tommie" Connor. 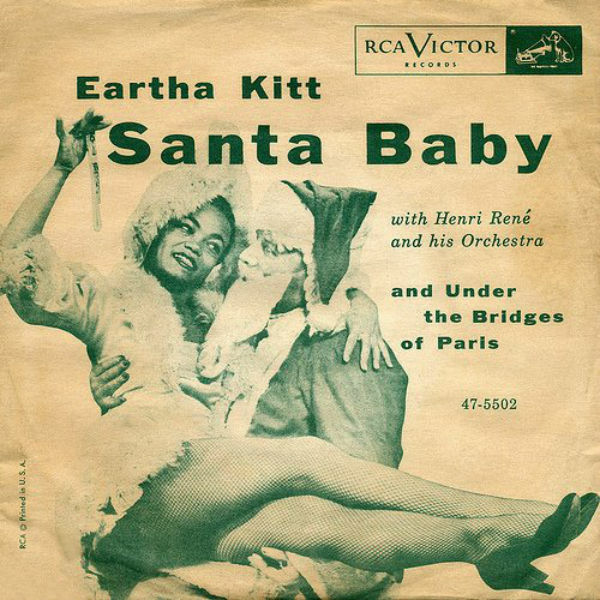 Sultry siren Eartha Kitt purred her sensual, materialistic Christmas wish list to sugar-daddy, Santa Baby. With orchestral backing by Henri Rene, it was a top-five hit in 1953; and it was also the biggest hit in the career of this bluesy American-born singer. Santa Baby was written by Joan Javits, the niece of Senator Jacob K. Javits and one of the few hit Christmas songs written by a woman. 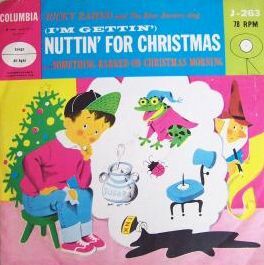 The most successful recording of the five versions of (‘I’m Getting') Nuttin' for Christmas was released by Art Mooney & his Orchestra with seven-year-old Barry Gordon as lead vocalist. Gordon's 1955 version became a million-record seller. Music and lyrics for Nuttin' for Christmas were written by Sid Tepper and Roy C. Bennett. Three other novelty recordings earned mention on our list: In 1953, eleven-year-old Gayla Peevey's I Want a Hippopotamus for Christmas made the top-twenty; and in 1950, Harry Stewart called himself Yogi Yorgesson to record I Yust Go Nuts at Christmas and Yingle Bells. The final novelty example of the time period is Stan Freberg's bitingly satirical Green Chri$tma$, a merciless attack on merchandising. This parody of Dickens' A Christmas Carol had Scrooge as the head of a Madison Avenue advertising agency; and although tame by today’s standards, it was extremely controversial at the time. The Rock 'n' Roll style of music influenced Christmas carols during the Fifties when Jingle Bell Rock entered the airwaves. Written by New England public relations man Joe Beal and Texas advertising writer Jim Boothe, 21-year-old rockabilly singer Bobby Helms recorded it in 1957. The song is regarded as the first rock and roll Christmas song and has hit the Billboard pop charts a record six times since its original release. It is second in popularity only to White Christmas with 120 million copies sold. Rockin' Around the Christmas Tree, also sporting a rock and roll beat is a joyful, catchy Brenda Lee recording and another Johnny Marks holiday song. While it was neglected in its first two seasons, the carole hit number sixteen on the Billboard pop chart during the Christmas season of 1960. Eight million copies were sold over thirty years. Blue Christmas, the song that would eventually be forever linked to Elvis Presley, was written by Billy Hayes and Jay W. Johnson in 1948 and became a hit for country singer Ernest Tubb in 1949. 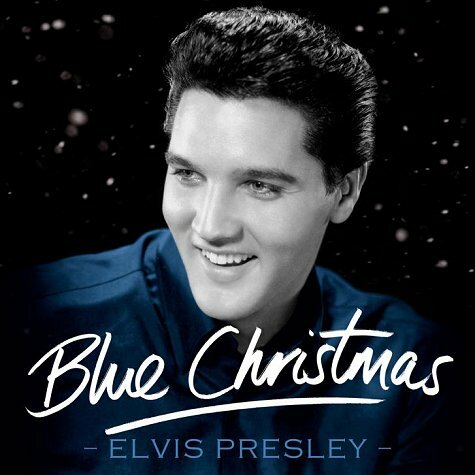 Presley recorded Blue Christmas for his 1957 Christmas album, Elvis’ Christmas Album. Wanting to emphasize the “blues” aspect of the song, the arrangement and tone of the carol is radically different than Tubb’s country version. The album went on to become the best-selling Christmas/holiday album of all time in the United States and has sold over 13 million copies to date. No United States singles were issued from the album until 1964, when Blue Christmas was finally released and reached the top of the Billboard Christmas Singles chart. Jingle Bells was originally written to be sung during Thanksgiving time, not at Christmas. The song was also the first to be broadcast from space when as Gemini 6 astronauts Tom Stafford and Wally Schirra sang the carol as a Christmas prank in December of 1965. They had first told NASA, "We have an object, looks like a satellite going from north to south--probably in polar orbit . . . I see a command module and eight smaller modules in front. The pilot of the command module is wearing a red suit . . . ."
Up on the House Top, written by Benjamin Hanby in 1864, is responsible for creating the idea of Santa and his reindeer landing on people’s homes before Mr. Claus heads down the chimney. The melody for Deck the Halls dates back to the sixteenth century, and the original Welsh lyrics are about celebrating New Year’s Eve, not Christmas. If you sang all the lyrics of Joy to the World, rather than just the second half of Isaac Watts’ famous carol, you’d know that the song is more about Christ’s resurrection than his birth and thus better suited to Easter time. The original name for Silver Bells was Tinkle Bells. Fortunately, writer Jay Livingston’s wife advised him that tinkle had a different connotation to many, and it wouldn't be appropriate for a Christmas song. The Best Carol List on the playlist below was compiled by Digital Dream Door* and modified to include only those songs published in the Forties and Fifties. The company's criteria for inclusion states that carols were chosen for "ongoing popularity impact, importance, and strong association with the holiday." You just have to click on any song you wish to hear, and the player will play it. Then, it will choose a new song and continue doing so until you turn it off or leave the page. Or, you can override automatic play by continuing to pick out and click on the songs you wish to hear. The choice is yours. Enjoy!